For most, vocalist and songwriter Robin Beck needs little introduction. She's been active in the music industry for better than 30 years, and her resume includes many solo albums but also collaborations with musical heavyweights such as Ashford and Simpson, Desmond Child, Ann and Nancy Wilson of Heart, Jonathan Cain from Journy, Paul Stanley, and Lee Ritenour. That's just the short list. Now she returns with her tenth solo album Love Is Coming with long time producer Cliff Magness and husband James Christian (House Of Lords). With this album Beck strays little from her roots: this is classic melodic hard rock in an AOR wrapper. Vocally, Beck has always had a smooth melodic voice with a current of blues and soul lilting through at times. Alternatively, I've never found her voice all that unique, like hearing Ann Wilson or Celine Dion. Often Beck reminds me of an American version of Bonnie Tyler. For the content of Love Is Coming, and as usual, there's a good variety of songs within. Beck can easily shift into the role and groove of a hard rocker, and does so with songs such as Island, Love Is Coming, or Crave The Touch. Alternatively, to dial things down a bit, there's some fine ballads with In These Eyes, the bit heavier Lost, the arena anthem sound of Here I Am, or If You Only Knew. That last song finds Beck at her most soulful and passionate. The album finishes with Warrior, another ballad-like anthem in a velvet AOR wrapper. Basically, Love Is Coming finds Robin Beck in excellent form and doing what she does best, delivering AOR melodic rock with passion, groove, and soul. Easily recommended. 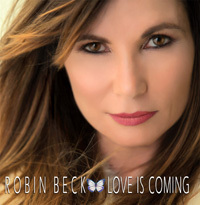 Love Is Coming finds Robin Beck in excellent form and doing what she does best, delivering AOR melodic rock with passion, groove, and soul. Easily recommended.